Welcome back to Doughvember! This week, Linda and I are giving away sourdough-related prizes, so keep reading if you’re interested in today’s giveaway. Have you had any sourdough adventures yet this month? I’m saving my bread baking for the second half of the month, but this week I decided to experiment with using sourdough starter to replace part of the flour and water in a simple pumpkin maple sourdough cake. The great thing about keeping a sourdough starter is that you can experiment with using it in all sorts of recipes. As long as you know the percentage of flour to water in your starter, it’s easy to figure out how much flour and liquid to replace in a recipe. I keep my sourdough starter at 100% hydration. That means that I feed it with equal parts flour and water (by weight). If you’ve followed my instructions for creating and maintaining a sourdough starter and have been feeding it with one cup of unbleached all-purpose flour and 1/2 cup water at a time, yours should be very close to 100% hydration because one cup of flour and 1/2 cup of water are close to the same weight (about 4 oz). If you’re interested in keeping your starter at 100% hydration and you’d like to be exact, you should start weighing your ingredients when you feed your starter. In order to keep your starter healthy, you should be doubling the amount each time you feed it. Since you don’t want the starter to take over the kitchen, you need to use or discard a portion of the starter before feeding it. A good amount of sourdough starter to keep on hand at any one time is 16 ounces (which is about 2 cups by volume). To feed the starter by weight, measure out 8 ounces of your starter and use or discard the rest. Feed the 8 ounces of sourdough starter with 4 ounces of flour and 4 ounces of filtered water (water should be at room temperature or lukewarm – never hot to the touch). Now you have doubled the amount of starter and you’re keeping it at 100% hydration. If you need to increase your amount of starter for a recipe, just keep doubling the amount until you have what you need for the recipe (plus extra to keep on hand). If you’d like to keep a smaller or larger amount on hand, that’s fine, too. Just remember to always double the amount (by weight) when feeding. By keeping your starter at 100% hydration, you know that it is always half water and half flour by weight. So 8 ounces of 100% hydration sourdough starter is always equal to 4 ounces of flour and 4 ounces of water. This makes it fairly easy to use discarded sourdough starter in any recipe that uses flour and liquid, especially quick breads. For example, If you want to use one cup of sourdough starter in a muffin or quick bread recipe, you just need to remember that you’ll be replacing 4 ounces of flour (about 1 cup by volume) and 4 ounces of liquid (1/2 cup by volume) in the recipe. Of course it’s not exactly that simple. Sourdough starter is acidic, so if you want to swap it in without changing any of the leavening amounts, it works best in recipes that would normally have an acidic liquid like buttermilk. But don’t let any of this scare you. Experiment and have fun! One thing to keep in mind is that when using sourdough starter in a quick bread or cake recipe, it’s not necessarily going to make your baked goods taste like sourdough bread. The “sour” flavor in sourdough bread is developed over the long, slow fermentation times that most of those breads require. In quick breads, the starter will add an extra bit of flavor and the texture will be a bit different, but it’s usually very subtle. On to the pumpkin cake. Since I’m still trying to avoid refined sweeteners as much as I can and because I thought it would be a great flavor combination, I used maple syrup in place of sugar to sweeten this cake. As cakes go, it’s not especially sweet, but after sampling a few slices Phil and I both decided that it was just sweet enough. If you’d like to increase the dessert factor of this cake, a smear of cream cheese frosting would be just perfect. 1. Preheat oven to 400 degrees and move rack to center position. Butter an 8-inch round cake pan (or coat with baking spray). 2. Start with all ingredients at room temperature. In a mixing bowl, whisk together squash puree, maple syrup, egg, and vanilla. 3. Fold sourdough starter into squash mixture until well combined. 4. In a separate small bowl, whisk together flour, baking powder, soda, salt, and pumpkin pie spice. 5. Add dry ingredients to squash mixture and stir just until incorporated. Stir in melted butter. 6. Pour batter into the greased 8-inch round cake pan. 7. Bake at 400 degrees for about 25 minutes or until cake springs back when lightly touched. Now I’d like to share a few of my favorite things I’ve seen around the web so far this Doughvember. Linda, my partner in sourdough this month, has created yet another Doughvember masterpiece. She wrapped a seared beef tenderloin with comte cheese and sourdough and then baked the whole thing. 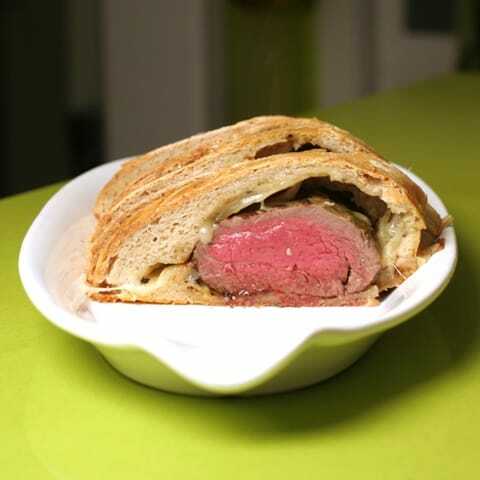 She then served the Sourdough-Comte Beef Wellington with Port-Fig Compound Butter. Head over to Salty Seattle for the recipe and another chance to win a Mavea filtered water pitcher (remember, sourdough starters prefer filtered water). 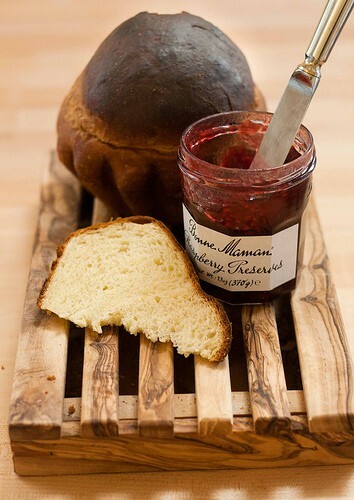 Sara from Three Clever Sisters decided to combine her loves of sourdough and brioche by making this beautiful Sourdough Brioche using the formula found in Tartine Bread (a book that is on my Christmas wish list). Kerrie from Serves Four has been keeping us updated on her sourdough baking via Instagram and I love this photo arrangement she created that shows her process of baking a gorgeous loaf of sourdough bread. Brandon from Kitchen Konfidence has been writing about his adventures in creating a sourdough starter from scratch using a slightly different method than the one I’ve written about here. His starter begins with whole wheat flour, water, and a red cabbage leaf. It might sound strange, but it’s actually a great way to get a sourdough culture started, especially if you’ve had trouble getting one going in the past. The white film that is usually visible on red cabbage (and on grapes) is actually wild yeast. Check out his progress on Kitchen Konfidence. And finally, here’s a photo of what I’ve been up to with my sourdough starter lately. 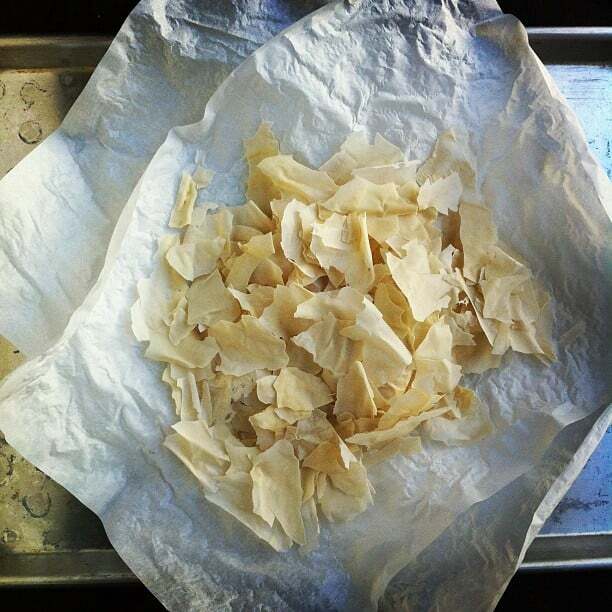 I dried a bunch of it to take with me to the International Food Blogger’s Conference in Santa Monica this weekend. I powdered it and divided it into 20 packets to hand out to anyone who wants one. If you’ll be at the conference and are interested in some starter (plus instructions for bringing it back to life), find me! If you’re interested in dehydrating some of your own starter for long-term storage or for mailing to friends, you can find good instructions at Chocolate & Zucchini. We have been following and communicating with the growing community of Doughvember bakers on Facebook, Twitter, and Instagram. If you’re talking about sourdough on twitter and/or posting photos of your creations on Instagram this month, please use the hashtag #Doughvember so we can all see what you’re up to. If you write a blog post this month featuring sourdough, send Linda or I the link (or post it in a comment). I’ll continue sharing links and photos throughout the month and we’ll hopefully come up with a big Doughvember roundup at the end of the month. 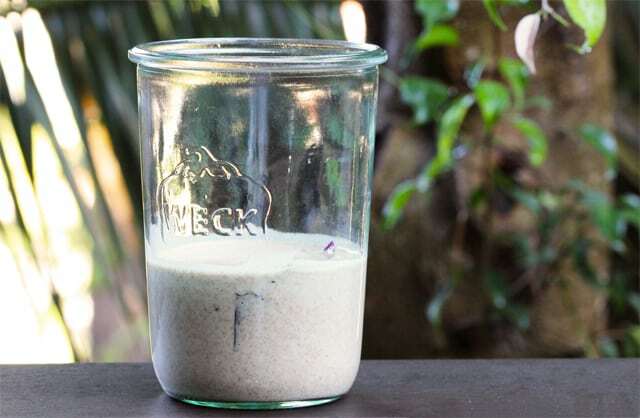 If you’d like to create your own sourdough starter from scratch and play along with us, you can find detailed instructions here. great giveaway. and my that cake sure looks delicious! Awesome giveaway. I can't wait to try that cake. Thanks for the sourdough recipes...have the starter ready and waiting. Excited to make some new things! Thanks for this recipe - great idea. I would love to win the pitcher too. My plan is to go back through your postings about making a sourdough starter over Thanksgiving week when I am off from work. It will be a great time to try it out. Take care and thanks! WOW ~ pumpkin and sourdough can't wait to try it! I already make a sourdough chocolate cake and which receives many praises from young and old a.k.a as grandkids and parents. Mmmm... that cake looks yummy! Never heard of a sourdough cake and am curious about the technique-- will definitely try it! Liked Pinch My Salt on facebook! Oh wow! So much information! I'm still working on my starter. I used half pineapple and half orange juice - I didn't have enough of either one. I'm going to start feeding it twice daily tomorrow! I'm excited for Doughvember! I'm always looking for new, inspiring ways to use up my sourdough starter. This cake looks excellent! Never have eaten a cake made with a sourdough starter but it sounds very interesting. "...after sampling a few slices," she says. What really happened is she had one, I had a few, and then a couple more. It's so delicious! This cake looks so moist and delicious! I can't wait to get my starter!!! okay ... i'm a bit of a bakery junkie, always poking my nose into those shops tucked away here and there ... but i have to admit that I don't think I've ever seen a sourdough cake before. am i just looking in the wrong places? cheers! PS. I like Pinch My Salt on Facebook. 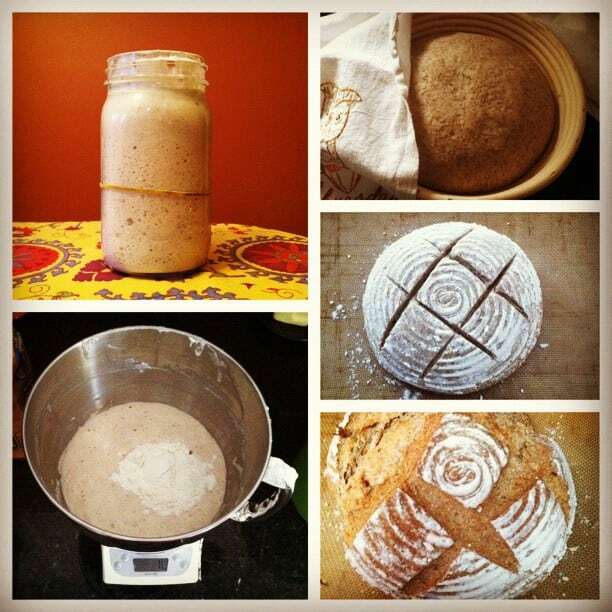 How informative about adapting for sourdough in recipes. I love the idea of using discard for something, not just trashing it, but never made the mental effort to figure it out. Good pointer to keep in mind re the acidity. Probably requires a little swapping in and out of baking soda for baking powder too. Wow, this cake looks really really good! bring on the pumpkin! i don't care what anyone says - pumpkin's in season and I. Want. More! I have made sourdough chocolate cake before that turned out fantastic. I can't wait to try sourdough pumpkin cake too! I liked pinch my salt on FB...love this cake and the giveaway!! Love this post! Perfect for Autumn. Oh thank you for this post!! I have had my sourdough starter for more than 10 years and have made countless loases but I have always wanted to use it for other things. Thank you for the concise and simple formula on how to use it in recipes. I'm very excited..I've decided to feed 'henrietta' and start experimenting soon. Thanks again! I've been making sourdough bread and other goodies for about 5 years now. I can't wait to try some of your sourdough recipes. Thank you. I now LIKE Maevea too!Love the looks of that pitcher, love filtered water but tired of looking at my Britta! Wow, that bread looks delicious...perfect for the cold weather that's kicked in. Can't wiat to try out the recipe. Mmm,yummy! I also like you on FB ;) How could one not! We filter all our drinking/cooking water! I wonder how this filter compares to our PUR. Just getting started with sourdough. Thanks for the ideas. I can't wait to start working with a starter, especially with pumpkin! Temptation cake! :)Never thought of sourdough cake. At what point do you add the melted butter? I'm making this now and realized I have melted butter just hanging out on my counter so I figure I'll add it with the wet ingredients. Hope that's right! Great contest. I've never really done anything with a starter, but I'd love to try. The Water Filter Pitcher is fantastic. Thanks for the opportunity to own it! Our starter is still going strong! Justin just needs to make some more stuff with it. Such a fun site!!! I've been looking into pitchers for a while...this one would be so great!!!! I liked Maeva on facebook. Well, as a beef geek/cook and non-baker, I've really enjoyed #doughvember so far thanks to you and Linda and Sharon, too. The second attempt at bread was a fail from a presentation perspective but the flavor is actually pretty good. On to the next challenge, Round 3. Love your site! Your recipes are awesome! I adore baking with sourdough starter. And, I just made some pumpkin puree recently, and this post is perfect timing. Thanks for the ideas, I'm looking forward to using my starter in other ways. Sourdough is a mainstay for many great recipes. the sourdough starter was so easy to make. I NEVER thought to dehydrate it, but of course that is how a dry starter mix would be done. would love to win the pitcher! Sourdough scares me. I like toasting it and slathering it with peanut butter though. I have been raised on Sourdough, as it is a regular staple in Alaska. but I can honestly say I have never had sourdough cake. I'm looking forward to trying this recipe. Thank you very much for the post. This cake sounds SO fall-y and delicious! I'm loving Doughvember; thanks for sharing. I made sourdough sweet potato pancakes after Thanksgiving with the leftover mashed sweet potatoes. They were the best! Thanks for teaching me to make my own sourdough starter! Love it! Oh my look at that!!!!!! I <3 Doughvember!! I'm loving all the sour dough info. I was inspired to try it for the first time because of you. I'm shocked at how easy it was to catch a yeast and grow it;) I considered getting a pet but I've had so much fun taking care of my starter I've decided to hold off on the pet and I've been baking bread like a crazy lady!! I maintain a sourdough starter, but haven't done much experimenting with it beyond regular breads and waffles. I will have to start playing some more! Nicole I haven't visited your site in a while (so many great food blogs, so little time! ), so now I see I've got to get cooking. Baking especially. So photography is so beautiful that everything is tempting. Off to the kitchen! This Doughvember is something! Please keep up the good work, love the pictures! Just about getting cold here in NC. Can't wait to heat up the house with some baking!!!!! All of this sourdough stuff is making me jealous! The pumpkin maple cake looks great! My husband loves anything pumpkin - throughout the year, not just around autumn. We moved to Florida 3 years ago and the baking here just isn't the same as home (New York). 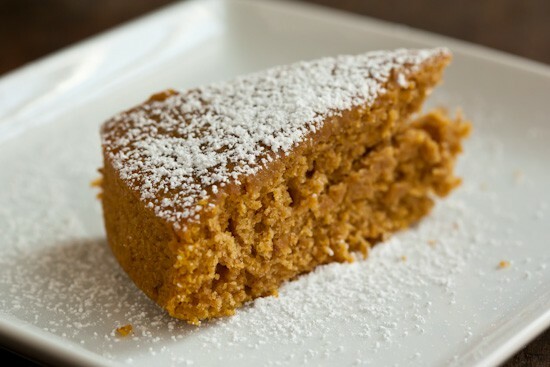 If you love pumpkin cake, I recommend you check out CrumbCakeCreations for New York Style Crumb Cakes. To die for! We order around the holidays and enjoy thoroughly. This recipe looks really easy - I'm going to give it a shot and see what the grandkids think! I love the way you discuss sourdough in such a professional way, and what a whopping flavor combination for the cake! I can't wait to try it as soon as we have pumpkin on the market. I realize this is an old post. But I happened upon this recipe when I had a pumkin craving and went searching for pumkin baked goods. Quick breads just wouldn't do, and nor would pancakes or lattes. I've been harvesting this craving for 30+ years. So I wanted to go all out...And no better way to do such than with cake. I also combined this with another recipe for pumkin coffee cake with strusel topping and maple glaze. So this cake, the other recipe's topping. It came out well. Just to speak on this cake though, I don't think it needs a topping. it's really good on its own. The pumkin and pumkin spice are subtle. And the sourdough is just barely barely there. It was excellent. Next time I will do the strusel and forgo the glaze. And call it coffee cake/breakfast. Haha! Thank you so much for the recipe! I know this recipe was originally posted several years ago, but I just found it this morning and wanted to let folks know the cake is fabulous! I made a few changes, but the cake was perfect. Changes were: used only 2 Tbsp butter (added 2 Tbsp applesauce), added one honey crisp apple, peeled and diced, and increased pumpkin pie spice to 1 1/4 tsp. Baking time was closer to 30 min. Next time I think I’ll reduce the butter to 1 Tbsp because the cake is plenty moist. Don’t pass up this recipe—it’s a keeper!